Get Yourself a Winner Here! Ok, I somehow pulled it off and managed to get in all my end of month deadlines — not sure how, as January was a really bizarre-sort-of-frenzied-month for me. (Speaking of which… where did it go? ..( Oh, back to my point — While I still have some mid & end of month deadlines coming up… plus trying to the new site up … I should be able to resume the last of the giveaways regularly again! While I am not going to promise daily — I am aiming for every other day. I could make them less substabtial and aim for daily but it takes away alot of the joy — and well, what good is that? Now, onto the less mundane stuff – the winner of the one giveaway I did pull off last week! Here’s the scoop:Winners need to contact me by February 10, 2009 by emailing me at khryctee[at]bellsouth.net, or leaving another comment here – with the correct email to notify them. I’ll need your mailing addies by then or else the beloved prize in question gets shipped off to the runner-up. And, just in case the runner up has a bad case of not-claiming-giftitis, then I will merely redraw a name. Someone, somewhere will want it badly enough If you don’t truly want that day’s prize let me know, or pick someone to pass it on to. Day 20– Click Here to read all about it ! Purchase your own by clicking the above link. YEA!!!! Thanks you Chrysti! I really really wanted to win (like I want to win every one of your drawings). Please contact me at hawthornefive at hotmail dot com for my address. thanks again. Totally made my day! I’ve missed you Chrysti. I enjoy your blog with or without the give aways and haven’t seen one in awhile. Glad you posted today (and I wasn’t even a winner). yahoo, I’m runner up!…I see the prize has been claimed already, but I think I may have to get this journal anyway. It looks so cool, and there were some great suggestions on what to do with it on the last post..lol. One of the kids in my Art I class has this book and it looks so cool. I may have to imitate her and run to the book store and get my own. 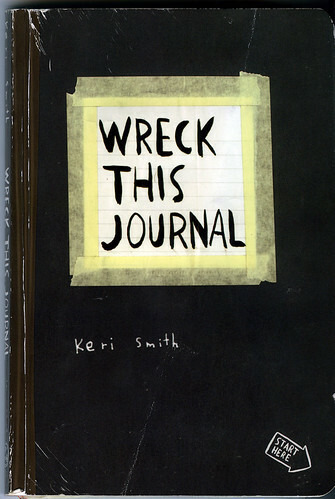 I have this journal, and am enjoying wreaking it. Hi Chrysti! Hope all is well! Boo-hoo! It wasn’t me! But congrats to Anna-Marie! Have a blast with the book! have a blast wrecking this book!! Congrats Anna Marie what a great score! Fantastic page, Hope to definitely come back again soon.